That's Capcom, not SQEX. They're quite different companies in some respects. I know, still preferred how Capcom did it. I think we'll see a trailer in December based on when it's going to be released and the information that has been shared. There was a Fiscal Year projection from Square that came out, maybe it was on the FFVIIRemake reddit, it states that there is an expected increase of sales starting FY 2020, which FY 2020 starts in Japan April 1st 2019. The development cycles (when they are full production, not concept stages) for FFXII was 6 years, FFXIII 5 years, and FFXV 4 years. Considering they are no longer using their own problematic engines anymore and what was stated about the cutscenes being farther along than KH3 I'm guessing that part 1 will be released either December 2019 or early 2020. Unless it coming out at the end of 2020, which would go against their projection, I doubt they will wait until the next E3 to start hyping up the release. Edit: I could see them showing something at Jump Festa which usually gets about 100k attendees each year. E3 was 70k which is the largest its been since 2005. The first video was kind of bad. The scaling of everything was really off. The second video was much better though. Honestly I want Square to take a page out of Capcom's book in terms of how they've handled the Resident Evil 2 remake. That's how you handle remaking a beloved entry in a long running franchise. You just let people know it's being made without the misleading tech demos stuff that FFVII Remake pulled with its E3 announcement and PSX trailer. Then once the game is ready to be released within a few months you show it off and give proper deadlines. Capcom did the right thing by not overhyping people by showing them a product that looked like it was ready to release in a few months, years before it actually was and that allowed people to keep their hype and expectations in check. What Square has done with FFVII Remake is create a situation for themselves where they simply can't win. Either the game comes out early and unfinished due to pressure from fans and investors like what happened with FFXV or it just simply doesn't live up to the hype once it does release on the intended schedule. Whatever happens Square has already doomed this game to not live up to its massive hype. The first one is okay but it's very sparse as well. I think the second one does way better of a job. There's so much more detail in the scene. The first one is still admirable though, anyone who spends time to create anything is better than doing nothing at all. the fireworks shot is in midgar so i suppose its from the remake as well. I mentioned to someone in the reply underneath, that that specific slide is showing three things. The 1st thing is a Prerendered look dev pic, which is what that T-pose FF7R Cloud pic is of, the 2nd pic of the guy in the mocap suit next to that pic of FF7R Cloud is of a real time mocap preview, which is using UE4. The 3rd with the fireworks at Midgar is from a "real time VR Express" at the Square Enix Cafe. All three of those were shown in the Visual Works showreel video shown just prior to the slide, though the showreel itself is not included in the video so it just goes straight to the slide afterwards. So only the first two would have anything to do with FF7R itself, with the 1st one most likely just being look dev CG test for the prerendered CG Visual Works did itself. Anyone want to take up bets on the public re-reveal of the project? Going for E3 2019 personally. I can post this every year and just change the year until I leave this mortal coil. The tweet itself is unrelated to the remake proper but at least we now know they have an account for that game specifically. Latest Famitsu featured comments from devs regarding going into 2019. Nomura and Kitase were among them and they basically teased some FF7 Remake stuff for 2019. Kitase: "FFVII Remake development is going well. We're working hard to meet fan expectations." I woke up pleasantly surprised by this! We'll see if they show anything during Jump Festa in the next few days, if not February is when it officially starts after KH is finished. That huge spike in profits/sales for the company for the 2020 fiscal year is likely related to FFVII. We'll see this finally out by April 2020, at least the first chapter. 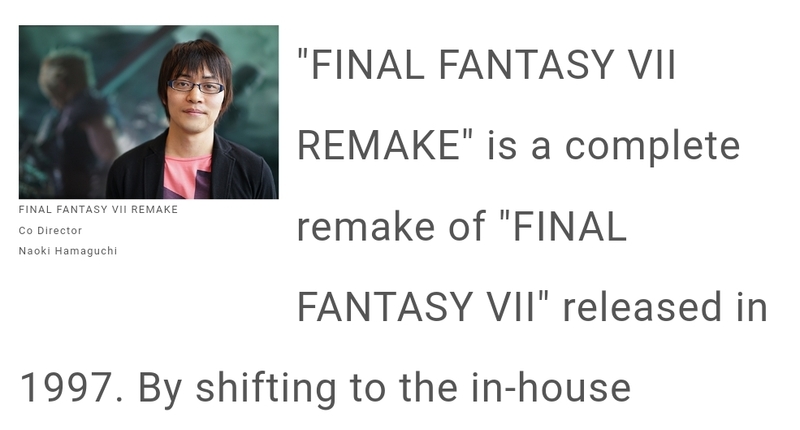 Edit: If it does come out by 2020 we can see it takes Square a 4-5 year production cycle to make HD FF vs. 2 years in the PS1 era. I say expect nothing from Jump Festa this weekend. As long as KH3 has not been released they won't start proper PR for FFVII as that was the plan they strictly follow. A 4-5 year production cycle for an AAA game in Square Enix seems to be normal. In today's industry if a company wants to churn out an AAA title within 3 years then it requires more than 1000 people involved in development. FFXV, their last biggest project, had around 300 or so. We can assume the number of people on KH3 and on FFVII each have something close to this number. A bunch of SE mobage just had some FFVII event and character stuff added to them. Mobage? What is that ?